...and let me tell you, that is a problem that I don't mind! Three of my Five on Friday have to do with food, so I'm not sure what that means, but it is what it is! Linking up with Christina, Amanda, and Karli! I'm just going to take a quick moment for a little husband brag... my sweet man made me dinner this week. And not only that, but he made eggplant pizzas. If you know anything about my husband it's that he doesn't think a meal is a meal without a little bit of animal protein - so he clearly had me in mind while making this veggie dinner. AND, John made me "boy cookies" for dessert!! "Boy cookies" are basically cookies with very imprecise ingredient measurements... and they are John's speciality! 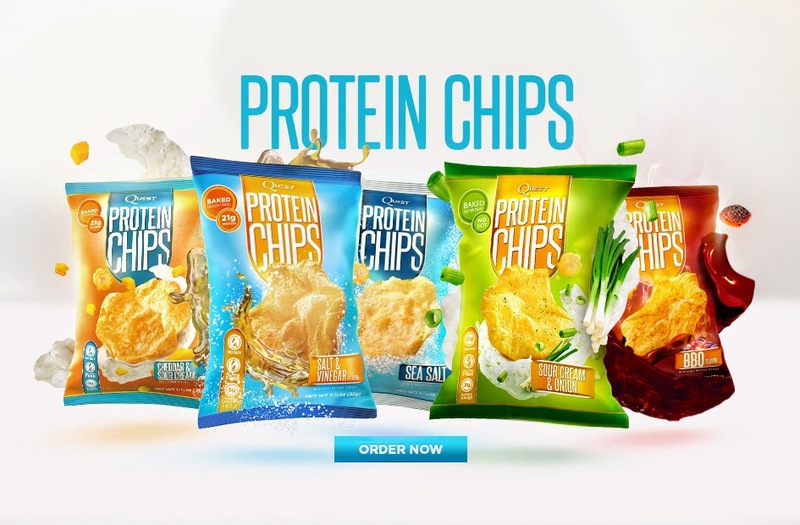 And since I'm on a food roll, have you heard of these Quest protein chips?! Now, they are certainly not Doritos, but they are a pretty acceptable substitute considering that they contain 21 grams of protein, with only 120 calories and 5 carbs. John and I have been wanting to buy patio furniture for awhile, and on a whim we finally bought a set! It is so nice to enjoy the outdoors while still being in our own space. 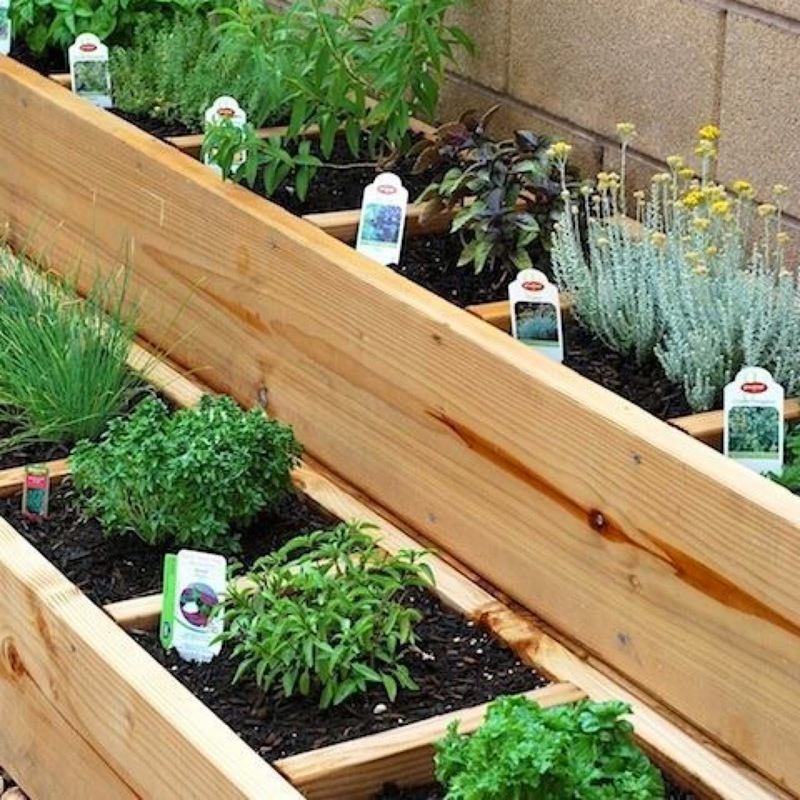 I've been perusing Pinterest for fun patio ideas, and I am absolutely loving the idea of a patio herb garden. I certainly wouldn't mind some fresh mint for mojitos this summer! I've mentioned it before, but a couple months ago John and I cancelled our cable... and it was the best decision ever. I have honestly not missed it one bit - Hulu Plus gets the job done! 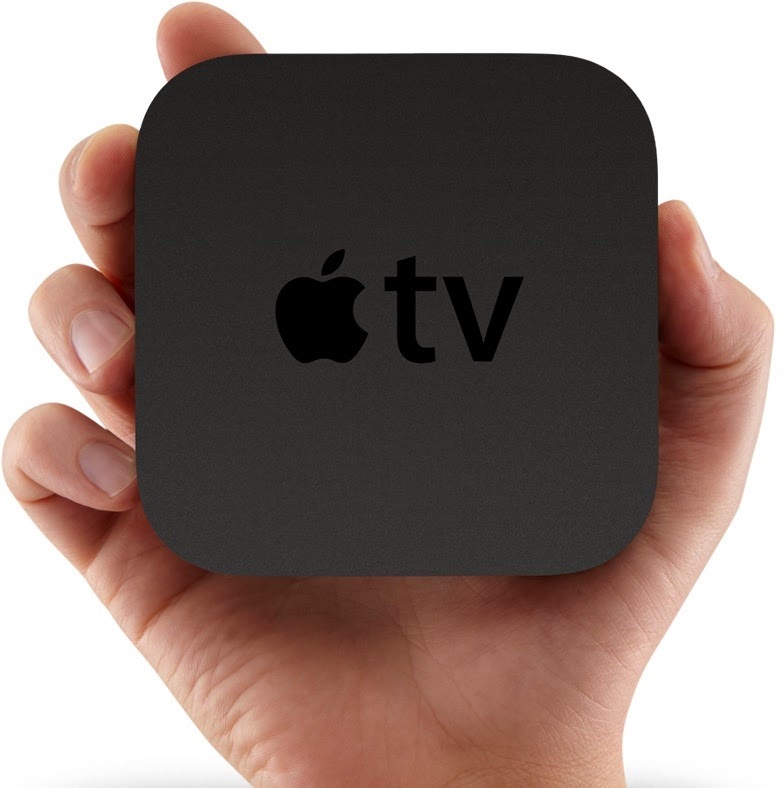 A few weeks ago we bought Apple TV (so that we could watch Hulu Plus and Netflix on our TV), and it is so great! There are channels that can be streamed and a ton of free shows to watch - highly recommend if you're considering transitioning away from cable! Eggplant....YUMMMMY! I have heard about the Quest chips but yet to try, thanks for sharing on that. YAY for patio furniture and being outside....life is better on the outside lol! 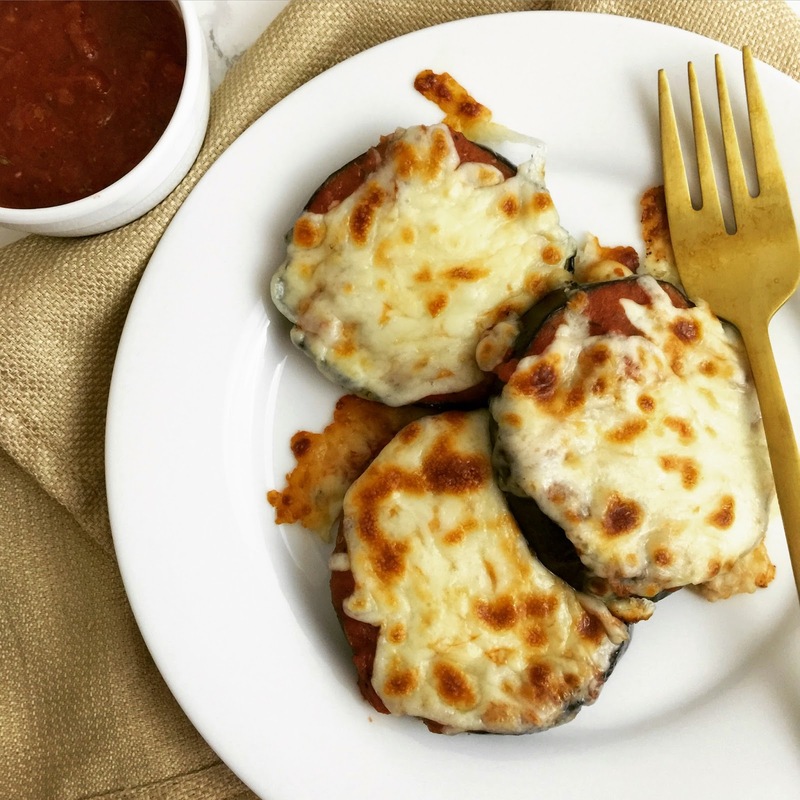 Eggplant pizzas… they look amazingggg. Props to your hubby! I hope you guys have a great weekend! Those eggplant pizzas look amazing - well done John! I'm planning to try out and herb garden this Spring too, I just hope it survives through the Summer since I don't exactly have a green thumb! But there's nothing better than fresh herbs (especially in mojitos!). Have a great weekend! Those pizzas look delicious! I love “husband cooks nights.” Love those cookies – what a treat he made dessert too! So on the same page with you two – we finally picked out our patio furniture too and are now decided what to do about flowers but a little garden would be so nice! My husband thinks the same way about dinner! haha You've got a keeper if he is making you cookies :) Have a great weekend! He made cookies and dinner?! He deserves an award for that! :-) We have grown herbs and vegetables in our "urban garden" and it's so much fun. I hope that you have a great weekend! So many people love Apple TV! I'm slightly technologically challenged so I don't really know what it's about, but it sounds like a winner! That herb garden is so pretty. I love the dividers between the plants to keep them separate. Happy weekend! Boy cookies, I LOVE IT! Never heard of that before!!!! Aww what a sweet hubby! Those cookies look SO good! And I'm going to have to check out those protein chips. They sound like a good snack for when I'm craving chips! Happy Friday girl! I wish I could transition away from cable, I barely watch TV...and when I do it is generally Netflix. We did away with Hulu when we decided to get cable. The hubby has too many shoes that aren't available anywhere that he can watch. Hopefully eventually we can do away with it! That's great that your hubby made dinner, like yours, my husband always asks where the meat is when I make a meatless dish. haha! Men. Those eggplant pizzas look delicious! We canceled our DirecTV as well and have been using my parents Apple TV. It really is the bomb! Did you know that if you have other Apple devices, you can go to the network website and stream a lot of their shows live and than just mirror it from your device to the TV? Some require a cable sign-on but we've got a friend letting us borrow theirs and were able to watch shows like the Walking Dead and Pretty Little Liars live! I love those herb gardens! And now I want cookies, as well. ugh :) Happy Friday! And we are about to cancel DirectTV as well, it's just a huge expense for something you don't really need. We watch Netflix more than anything else anyway. So proud of you guys for cutting the cord! Eggplant pizza... oh yeah... I know what I want to have for dinner tonight now. I love eggplant, probably my favorite veggie. Those cookies look pretty tasty too! Hahahaha to "boy cookies!" What's funny is in our house, my husband is more precise and I definitely make the boy cookies lol. Those eggplant pizzas look amazing, too! Eggplant pizzas? Yes! Yummy looking cookies? Did you even have to ask! and the protein packed snack? Duh! :) ...I'm a vegetarian so love this! All that cheese on those pizzas looks amazing. Glory! Awwwww love that John made dinner, complete with boy cookies!! :) yay for thoughts of an herb garden!!!! Fresh tomatoes would be good in pots too! Your hubby did a great job with those pizzas! I sooo want to do an herb garden too! That eggplant pizza looks delicious! And I love the idea of these boy cookies, haha. I hope yall have a great weekend! I'm like your husband as far as including animal protein to consider it a full meal. However, those eggplant pizzas look so delicious that I have to give them a try. I love the Quest bbq chips, I think they are fabulous. People either love or hate them haha. I don't love them so much alone, but with a sandwich or wrap I swear they are so good :) Yum cookies, I'd love one right about now!